Isolated Flyback Converter Basics: What are Characteristics of Flyback Converter? There are three types of flyback converters: In addition to the commonly available PWM control type, self-exciting Ringing Choke Converter (RCC), and quasi-resonant type applying resonance technology to the RCC. These converters are widely used in switching power supplies up to 100W. The basic circuit is a simple one, as illustrated in the figure, composed of a relatively few components. The circuit chops the input voltage (DC) by using a switching transistor and transmits the energy to the secondary side via a switching transformer. The secondary side rectifies and smooths the output and converts it to a required DC voltage. The actual circuit is provided with additional feedback and control circuits that monitor the output and control the switching transistor. Flyback converters can be configured for both step-down and step-up operations, capable of accommodating both isolation and non-isolation applications. While offering the advantage of accommodating a broad input voltage range, on the deficit side the converter, in which relatively large peak currents flow to the switching element, diode, and output capacitor, requires components capable of controlling such current flows. In situations not requiring a great deal of output precision, an approximate output voltage can be set in terms of a transformer winding ratio for use as an unregulated output power supply unit. ・The flyback converter should be used as appropriate based upon a solid understanding of its characteristics. 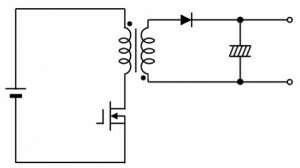 Isolated Flyback Converter Basics: What is Switching AC/DC Conversion?